As CVS and Walgreens improve their beauty aisles into stores within a store, and ULTA Beauty is building on their belief that higher-end brands like Lancome can be sold under the same roof as budget-friendly L’Oreal and one-time beauty supply store staple NYX, Sephora remains the behemoth of makeup shopping, or more honestly, makeup splurging. (ULTA is, however, becoming real competition for Sephora, as it was announced that famed M.A.C. will be sold at its stores and online come May and June 2017). Seemingly, Boston has become a popular destination for Sephora flagships. This is exceptionally noteworthy considering as a city, it’s been noted both locally and nationally that a lack of abundance or push for individual style exists. Same goes for its non-cavalierly ways with makeup for much of its residents. (It has gotten better, or funky what have you). For both the bold and athleisure-inspired, Sephora is the place where they congregate as a larger beauty-loving collective. Encouraging Bostonians to give that electric blue eyeliner or lilac based red lipstick a shot, or experience the beauty of the au naturel look once the mascara that actually curls and inks the lashes or foundation that doesn’t need to be caked on is found. Last year, a Fenway location opened, just a store away from Target, helping to turn the area into more of a hang-out, shop and eat plaza by historic Fenway Park. 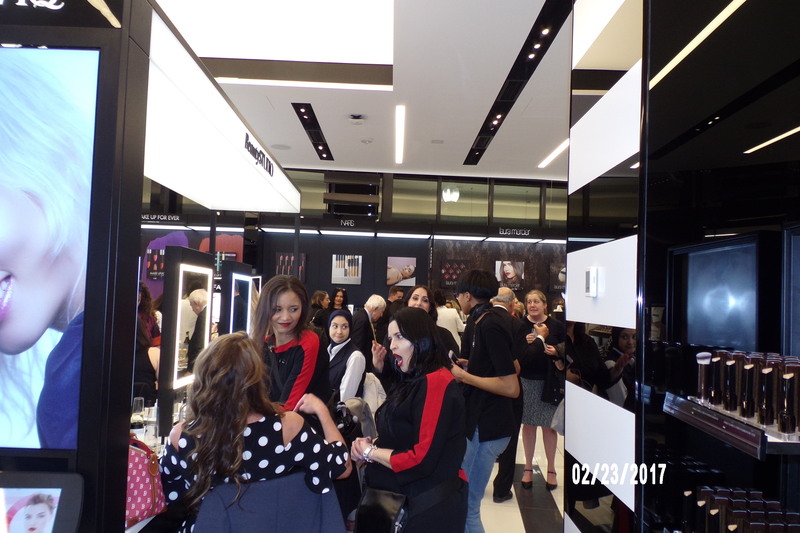 This followed the grand re-opening of the Prudential Center site in the heart of the city, a pit-stop for Sephora’s biggest fans in metropolitan Boston for years. 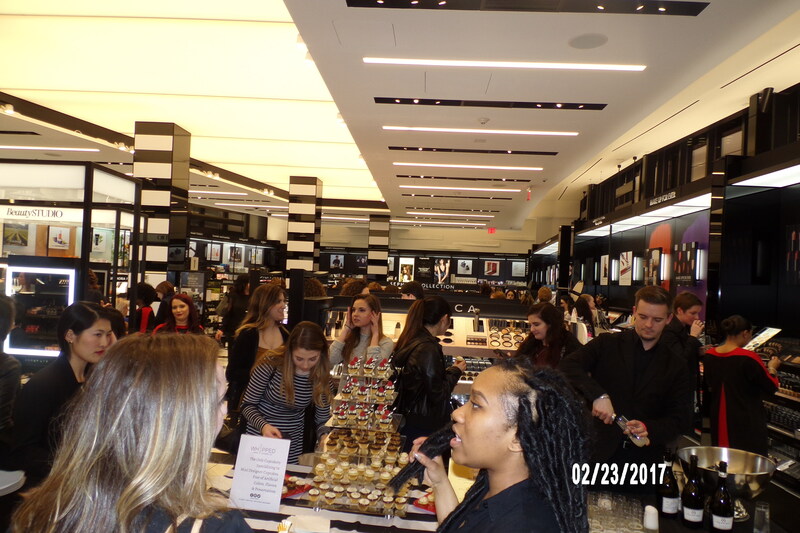 On Friday, February 24, Sephora commissioned its third locus in Faneuil Hall, a popular marketplace to visit during the warm seasons and days, as well as the holidays. Replacing a greenhouse that once stood there, it is situated a bit off-kilter as opposed to the building that houses Abercrombie & Fitch across from it that is tall and has many floors. The unusual placement adds to its charm, and this Sephora is no less sophisticated and prepared for the dedicated makeup and skincare enthusiasts they are seeking. 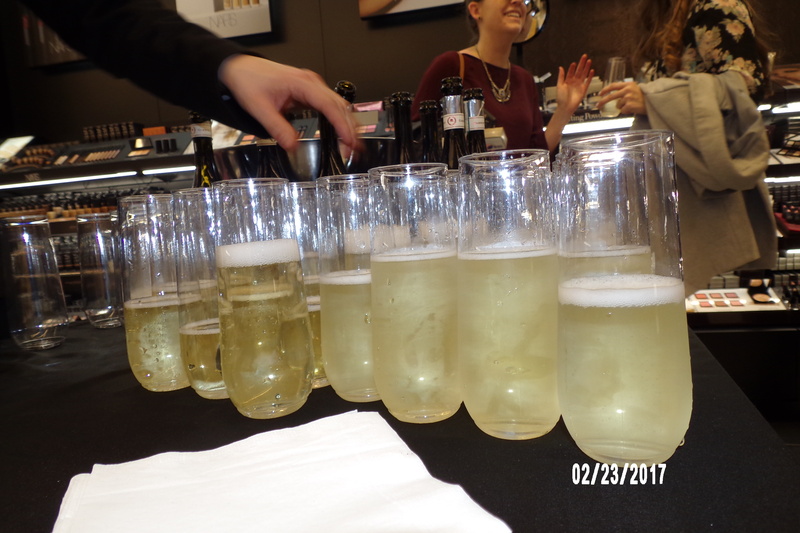 The night before, on Thursday, February 23rd, a soft launch was instituted, welcoming local PR types, beauty bloggers, and whoever else got on the guest list to check out and shop before the ribbon-cutting opening at 10 AM. I was there as well! (Because I couldn’t resist a Sephora party). After the kind reception from the Bold PR associate at the door (very gracious people, BTW), I was further greeted by a healthy throng of various conversations happening at once, employees in a flurry, and Liz Ladoux, who I remember used to go by the moniker MS Thang, djing. Having been a Sephora customer for too long, the decor and set-up were familiar. I was mainly curious about the atmosphere. Would Faneuil Hall be a good fit for this business? Would the clientele be different? How tourist-laden will it be compared to the Prudential? 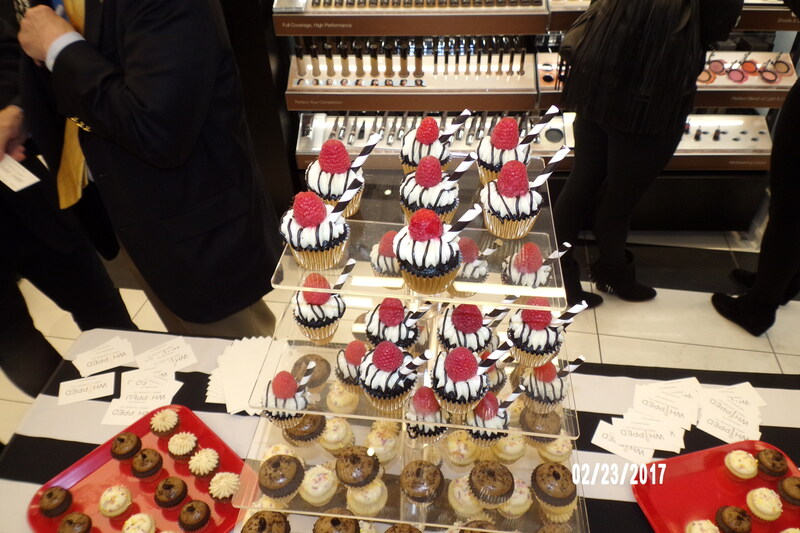 The ritzy touch was courtesy of the “exclusivity” of the launch, the music, and the offerings of Gambino Prosecco and mini cupcakes by Whipped. The cupcakes were delicious. I promptly ate three of the red velvet ones. Later, I tried birthday cake and in went another three in my belly. 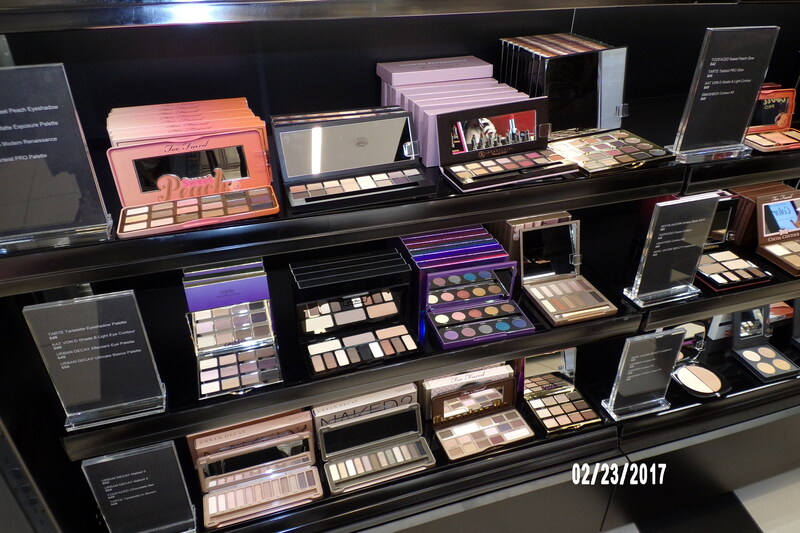 Plenty of the same brands were on display such as Bobbi Brown, Dior, Smashbox, and Make Up For Ever. I was excited to see The Estee Edit and MILK and I was on a mission to re-swatch Marc Jacobs’ new Highliner Matte Gel Eye Crayon Eyeliner (amazing). In-between being proffered by the Sephora girls, the manager and I met while I perused the same products I already knew were available from Urban Decay. He asked me in a friendly tone what I thought of the new location. I gave my honest opinion in that I thought it was pretty great, and cool that Sephora considered Faneuil Hall. I reassured him that I would be stopping by a lot. Which will be truer once spring is in full bloom. 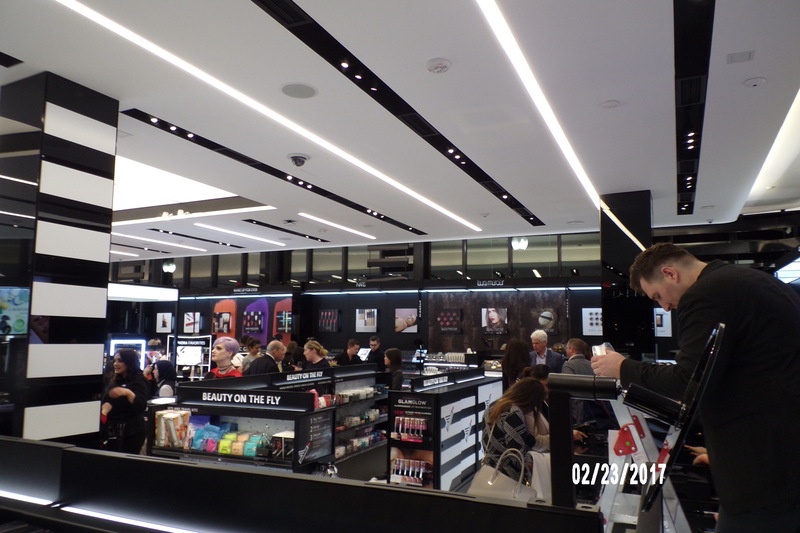 Otherwise, the vibe of the store was really fun and everyone seemed to be enjoying themselves, and as I’m sure they’ve done plenty of time before, fill up those Sephora black and mesh take-out-esque shopping bags with coveted items. I left with three items: The Lip Pencil in 044 (true brown but with a touch of red), a limited edition “Edgy Neutral” Amuse Bouche lipstick (inspired by concealer shades) in “Portobello” (a caramel-ish hue), both by BITE Beauty, and Jacobs’ Highliner in “(Whirl)pool” (a turquoise). Below are some snaps I took on Thursday night. I would’ve stayed past the hour I was there, (it was still lively! ), but I had a living legend to go see at the nearby Wang Theatre, otherwise known as Lauryn Hill.